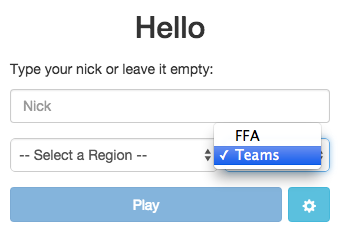 A new game mode was recently released on Agario called team mode. In team mode, you are randomly assigned one of three colors: Green, Blue, or Red. Everyone who’s green is on one team. Everyone who’s blue is on another. And everyone who’s green is on another team. Now, go eat everyone that isn’t (insert your color). Pretty simple right? Feed your teammates if necessary. If you see a team member trying to eat another blob and is unable to do so because his blob is not big enough, press w to feed him. Since you have to be 125% of another blob’s size to absorb it, your team member may not have enough mass even though his blob is bigger. By feeding him and sending some of your mass to your team member, you may give him enough mass to absorb the opponent’s blob. Be courteous. If a team member feeds you and you’re able to absorb an opponent’s blob because of it, return the favor. Feed your team member back by pressing w a couple of times. I always like to do this as it helps establish a relationship with the team, in a game with no chat. Feed your team members if you’re leaving. If you are done playing (hah), or need to leave for whatever reason, find someone who’s on your team and feed him all of your mass by spamming w into his blob. If you end up leaving without doing this, another team’s blob may come by and eat you. Stay close to your team members for protection. If you venture out alone, you may end up getting cornered by opponent blobs. By staying with your team, you will have an added level of protection, and you can also protect your own team’s blobs as well. If you see your teammate running away from a larger blob, do not stand in their way (Unless you like seeing your teammates die, of course). You may end up slowing down your teammate or trapping him, allowing the larger blob to absorb your teammate. Do not be selfish. If you see your team member being chased and you can feed him some of your mass to make him large enough to not be absorbed, do so. If you do not, you may end up paying the price if the opponent’s blob gets big enough to absorb you.